I tried to included highest rates, best-selling and themes that are destined to succeed. If you feel that some themes are missing, please leave a comment below and I will list it on this list. 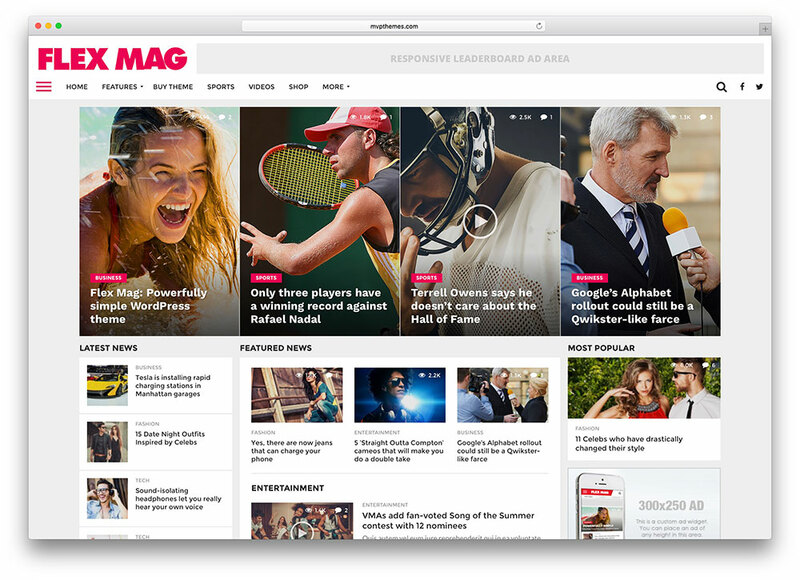 Newspaper 9 is the best theme for the publishing industry and the bestselling news theme of all time. It comes with features specially designed to bring more readers to your pages and create a long lasting impression on your audience. It comes with a fresh, modern look and over 50 demos that can change your website’s design effortlessly. 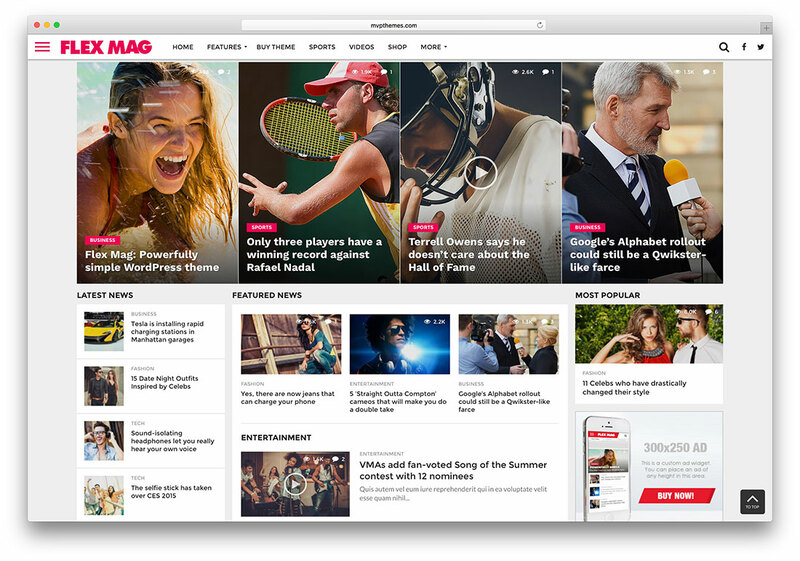 The Newspaper theme includes tagDiv Composer, the first page builder ever developed exclusively for this industry. Just drag, drop and arrange over 100 elements directly on the frontend of your site. Moreover, the new version of Newspaper brings the tagDiv Cloud Library that holds 420+ pre-designed templates for single posts, author, 404, categories or tags pages. All these new layouts are flexible and customizable on the frontend using the tagDiv Composer builder. Newspaper comes with smart features, implemented to expand your website’s capabilities and improve its performance. The Mobile Theme plugin, included in the Newspaper template, automatically optimizes the site for small screen devices. The creators also made Newspaper ready for the Google Accelerated Mobile Pages with the custom-made plugin that ensures a faster content speed. A huge variety of handcrafted blocks and modules allow you to choose the way your content is displayed. Eye-catching full Big Grids, versatile Flex Blocks, adjustable elements, multiple headers, and footers are ready to impress your audience. They also made the documentation detailed, and it walks you through each phase of the process with narrated video tutorials. 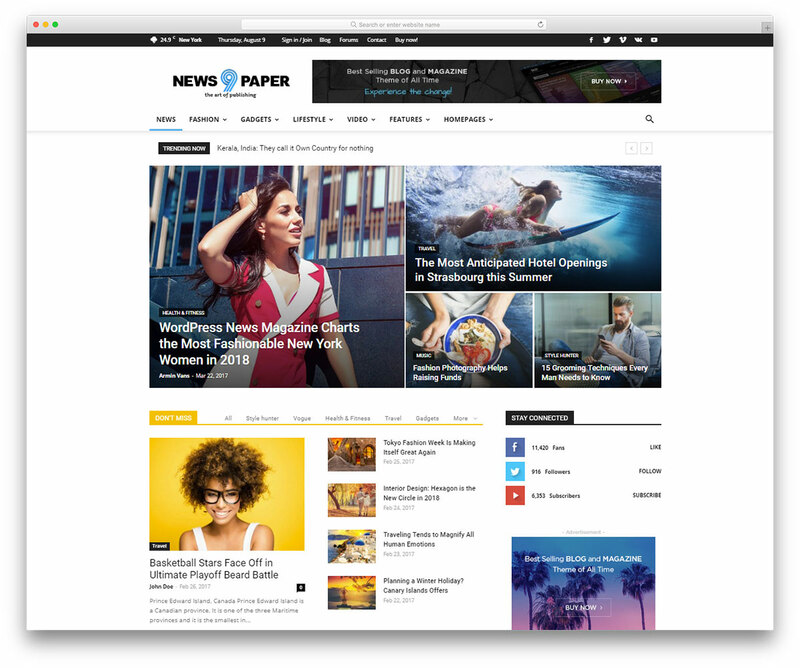 With Newspaper, your magazine site will constantly receive updates. The theme uses the best SEO practices, increasing your website chances to obtain a good position in search engine rankings. Newspaper also comes with an intelligent ad system designed to help you monetize your site using AdSense or adverts. Gillion is a WordPress theme made for publishing and writing especially blogs and magazines. It comes with 7 awesome demos to try different styles at once. Get it now and find many of its great plug-ins compatibility. 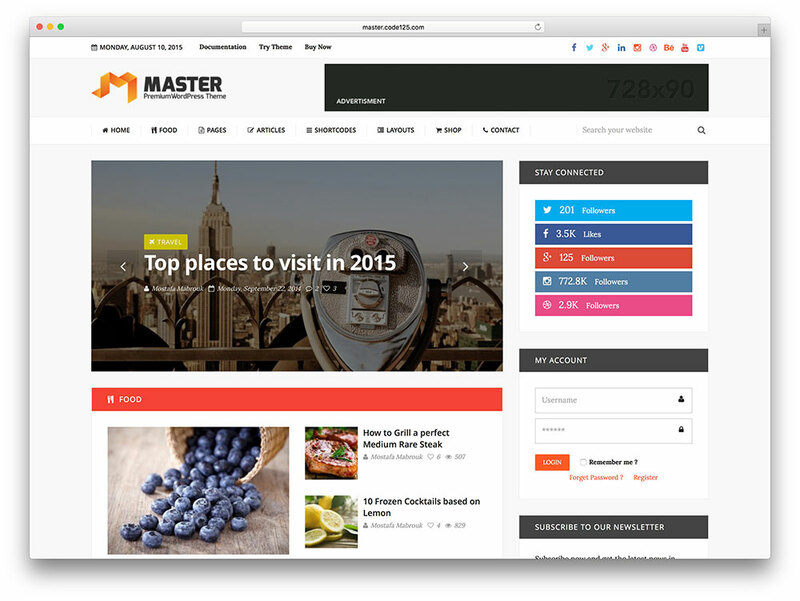 With a flexible layout with unlimited colors and many blog styles to pick. It is also SEO and speed optimized. Moreover, it uses Visual Composer as builder and comes with Unyson framework. Play with its multiple headers a top bar, alongside social icons full integration. Furthermore, the developers made it widget ready and they fully documented it for easy set up. You can ask your questions through its premium custom support team! 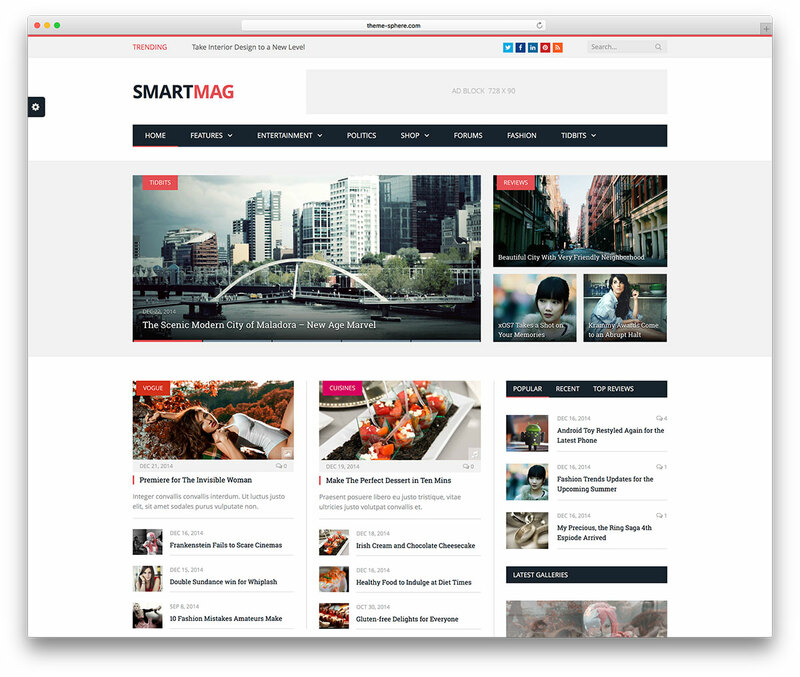 SmartMag is a resourceful and responsive WordPress magazine multipurpose website theme. Webmasters from all walks of life can put together polished magazines in a matter of minutes. With SmartMag, design and customization is effortless. The Visual Composer and Revolution Slider keep your content engaging and customized. Awesome slideshows and showcases put your finest content up front and center. Compatible with bbPress and well-suited for hosting forums. Additionally, with advanced admin panel settings let you turn your magazines inside out in moments. An integrated review system lets you produce dedicated reviews for any product. Create endless custom fields and rate products or items in a number of ways. Awesome navigation is possible with sleek MegaMenus and multipage articles. They increase your ad revenue in an instant and keep your pages dynamic. A responsive and well-suited for appealing to users across platforms and devices. Get SmartMag set up today, and let the world know what’s up! 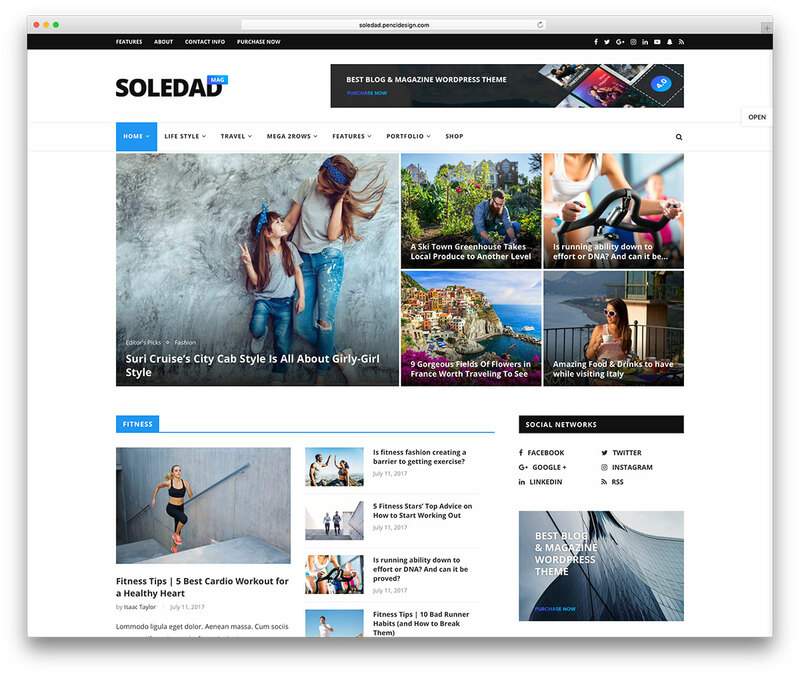 Soledad has earned the distinction of being the top selling blog theme of the year. This WordPress product offers a professional, user-friendly experience. Users can easily access your content from laptops, desktop computers, smartphones, and tablets. The setups process can be very intimidating for novice users. Thankfully, this theme has introduced an informative tutorial video that offers to guide you through those first steps. Additionally, Soledad has more than 250 interesting homepage demos, and over 200 layout combination options. There are 3 distinct sidebar layouts, 5 layout versions for articles, and 6 portfolio styles. Selling merchandise is very convenient, thanks to the introduction of the WooCommerce plugin. You can showcase your photos in galleries, and you can even implement modern video backgrounds. For novice users, the creators added a well-written documentation source. MagPlus is a responsive and super flexible WordPress theme that aims to make you a name that stands out. Want to build your new feminine magazine or blog? Here is the tool for just that! Specialized with 20+ sliders, 4 footers, 18+ headers and 10+ blog pages. It counts with portfolio advanced typography and icons provided for information display. With Yellow Pencil editor and its galleries, there is sure to be something for you here. Have fun and feel sassy with all customizations at your fingertips. 100% responsive and adaptable to all screens and browsers. Shortcodes, Visual Composer, WPML and WooCommerce are some plugins you get to play with! Social sharing is enabled so you get to your target niche! Use any of its shortcodes, or wide documentation and see just how easy it is. Bring your imagination to life; create your business/writing blog using MagPlus! Running a successful online magazine requires professionalism and unwavering commitment towards quality. The internet only rewards those who can provide a consistent stream of entertaining content. Your website must be excellent, and WordPress themes like GoodLife can facilitate its creation. This is a very user friendly product, and it eliminates the need to hire professional web developers. Even novice users can craft eye-catching pages. The theme’s design is aesthetically pleasing, and fully responsive. Readers will be able to browse your articles from their tablets and smartphones. 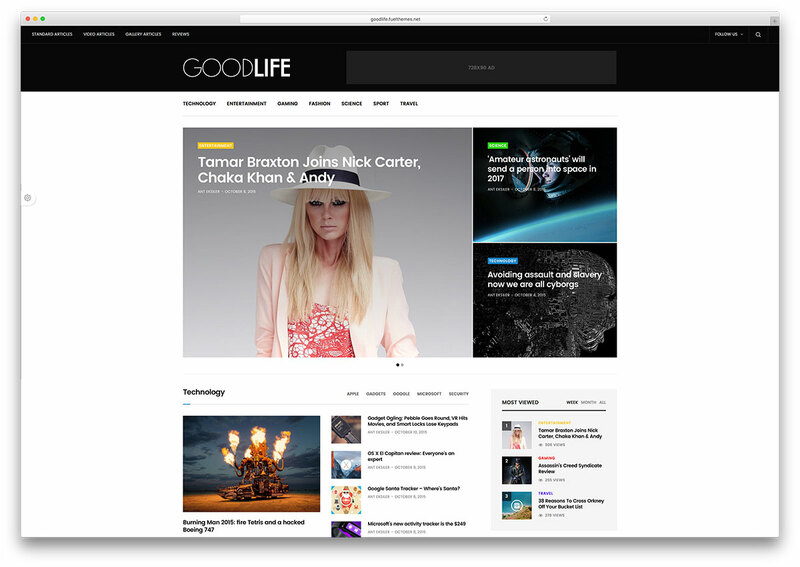 In addition, GoodLife is compatible with most major browsers. A sizable collection of modern features were added, and each feature promises to expand your page’s capabilities. It is possible to customize the typography of each article, in order to provide some variety for your followers. Posts can be sorted under multiple categories, and you will gain access to a limitless number of sidebars. A nifty comment system was made available, enabling readers to discuss and debate the subject of every post. Since we live in an age where every phone has a camera, embedded videos have become a crucial part of any story. Site owners can easily construct video playlists via WP oEmbed API. 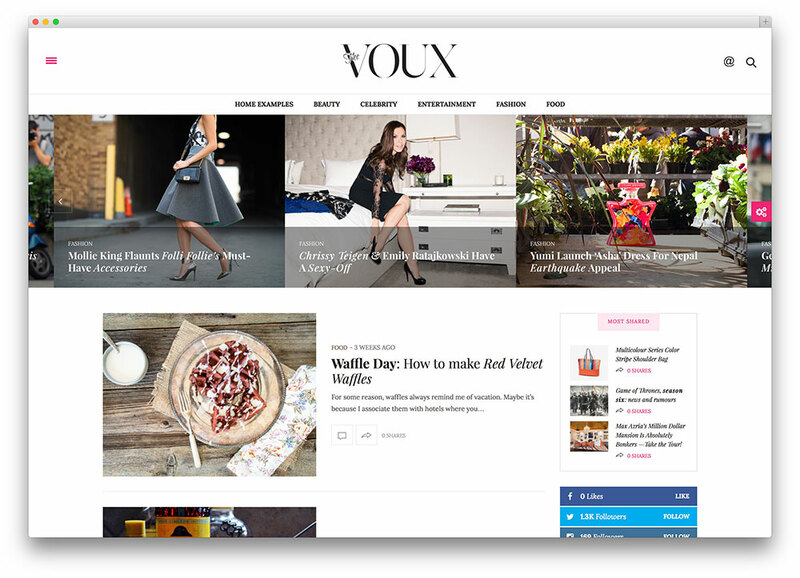 The Voux is a comprehensive WordPress theme for magazines. Websites with complex and interesting layouts usually have to sacrifice their mobile capabilities. 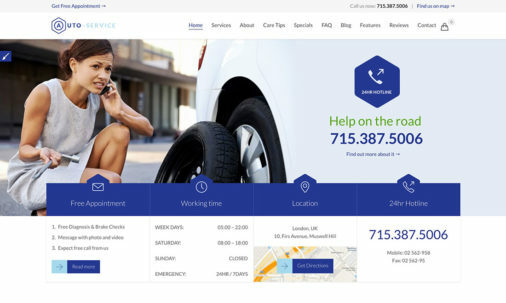 However, this product is entirely responsive, as it promises to look great on both computers and mobile devices such as tablets and smartphones. The Visual Composer allows customers to personalize all aspects of their site, resulting in a unique experience for each individual. It is the first ThemeForest product to ever integrate this feature. The data that is meant for sharing is usually kept on WordPress, and it can be seen while accessing the back end. The Theme Options can designate its cache period and the specific Social Network on which it should be shared. Linking articles has become easier, due to URL’s ability to change, depending on what page is being viewed. As site users scrolls down the page, the next article will load. This reduces load time for readers, and improves their overall experience. Using this theme, your page can be translated into different languages. This is vital to the expansion of any site, as you seek to attract visitors from different demographics. 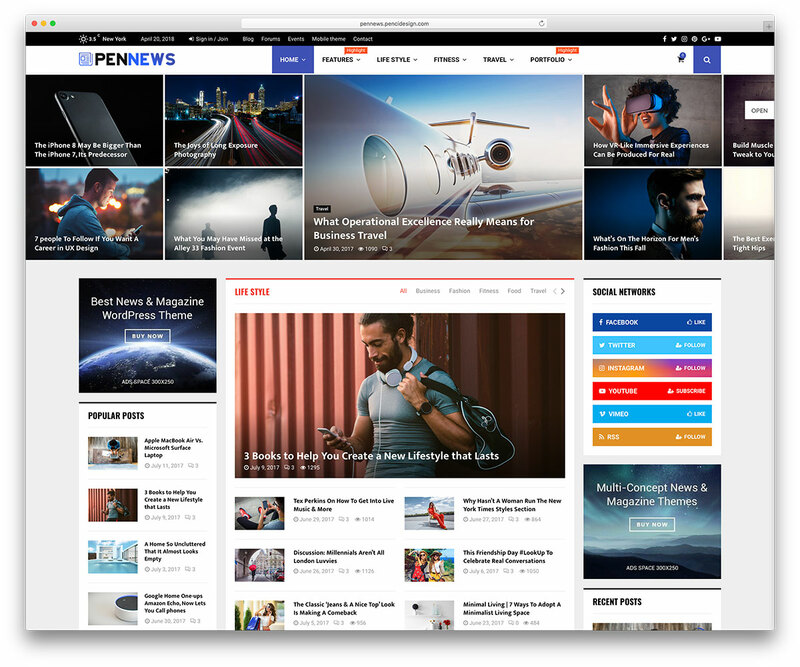 PenNews is a colorful, multiconcept and responsive WordPress news & magazine website theme. This theme is ideal for niche market magazines and news blogs of all kinds. With a wealth of demos and templates plus the WP Bakery, customization is effortless. You won’t need to write a single line of coding to get professional results. With custom content blocks for all sorts of niche purposes, PenNews is versatile. Dazzle your audience with sleek the Revolution Slider plugin and showcase featured content. Deploy impressive visual hierarchies with the Master Slider and LayerSlider. PenNews provides you with the trappings of a polished online magazine. Sharp and efficient, PenNews performs well across all devices and traffic conditions. Awesome Facebook Instant Articles and Google AMP technology facilitates reaching social media audiences. Unlimited ad spaces make PenNews perfect for monetizing your project. Take things up a notch, with PenNews! Flex Mag is a highly stimulating WordPress responsive multipurpose magazine theme. A powerful theme that has been endowed with the strength and flexibility to seamlessly service a huge range of different website needs, from blogs and portfolios to journals and more. With an amazingly simplified interface capable of producing websites ranging from the conservative and businesslike to the utterly psychedelic, owing to its powerful customization capabilities, with multiple preset skins to choose from. Several diverse and thought-out Featured Posts layouts for showcasing your featured or categorized content on your homepage or on any page you see fit. Sticky Sidebars to maximize content exposure, multiple unique, customized widgets to make your website’s content truly stand out from the pack, and out of the box compatibility with WooCommerce and bbPress—Flex Mag is the theme that can do it all. 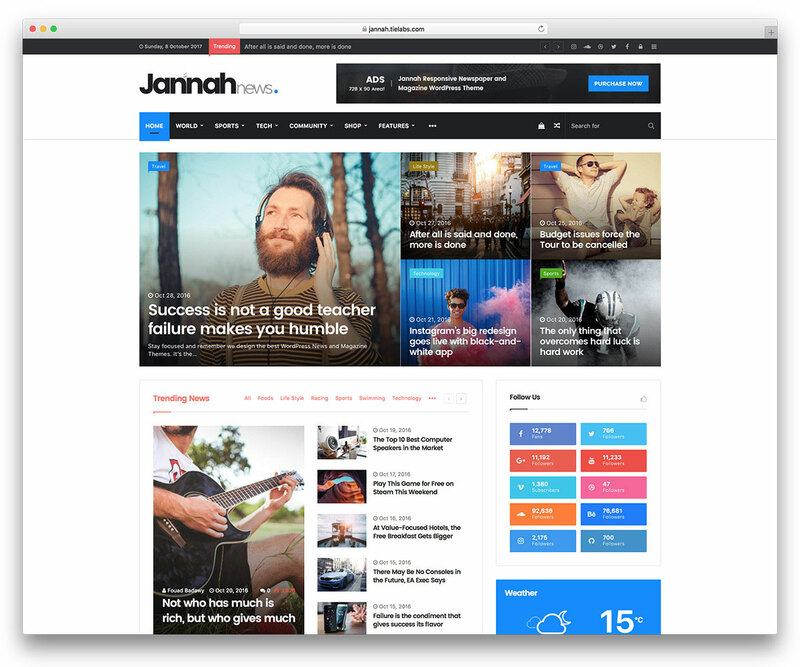 Jannah is a WordPress theme, perfect match for magazines. It has so many features that go with the aim of a magazine. You can have topics, popular posts, trending videos, follow us, or Youtube. A very responsive and retina ready, so all devices are ready for your website. And it’s is mobile-optimized by AMP. Create forums and moderate them. Additionally, the bbPress integration makes it fast, clean and managed from one central account. Your readers are going to love building Video Playlists, which is a great way to keep visitors longer. With pre-skinned demos: dark, light or everything between And the customizable layouts offer you so many options. They could be full width, boxed, bordered, masonry or straight up one column. Another magazine special feature is ‘Select and Share’. That feature recognizes the social media share function, and shows the sharing options you have enabled. And you can do that because Jannah is BuddyPress integrated social media. There are more: Jannah has a series of ready-to-go custom widgets. All styled to sit beautifully inside of the design you lay down. Take your design to the next level. Get Jannah! 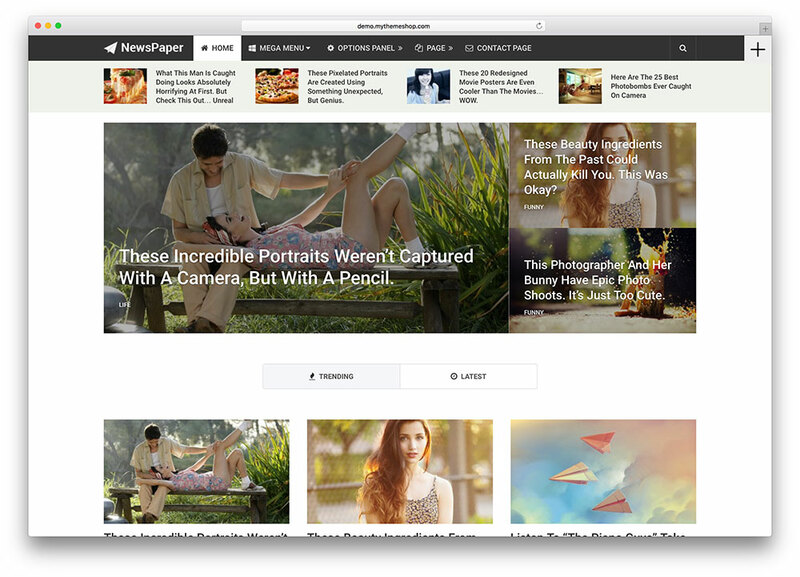 Newsmag PRO is an adaptable WordPress premium multipurpose magazine website theme. Developed by a dedicated team of coders and graphic designers working to produce a resourceful, thorough yet intuitive framework for the speedy and seamless creation of marvelously creative, handsome and fluid magazine websites with a range of sophisticated features and capabilities at your disposal through entirely visual processes that require absolutely no coding. Perfect for all kinds of magazines, from entertainment or variety magazines to high-brow online newspaper magazines, sports and tech magazines, and all similar, related projects. Jam-packed with premium quality plugins and widgets to make your life easier, and a robust technological backbone founded on HTML5, CSS3, Parallax and AJAX provide you with a wealth of animations, transitions, smooth dynamic layouts, scrolling effects, searching and filtering capabilities and much more under the hood. With limitless custom content sliders as well as endless custom content carousels, your audience will remain interested and engaged while you get to showcase your latest or featured content. Cross-compatible and mobile-friendly, Newsmag PRO can help you expand your audience to the whole globe! 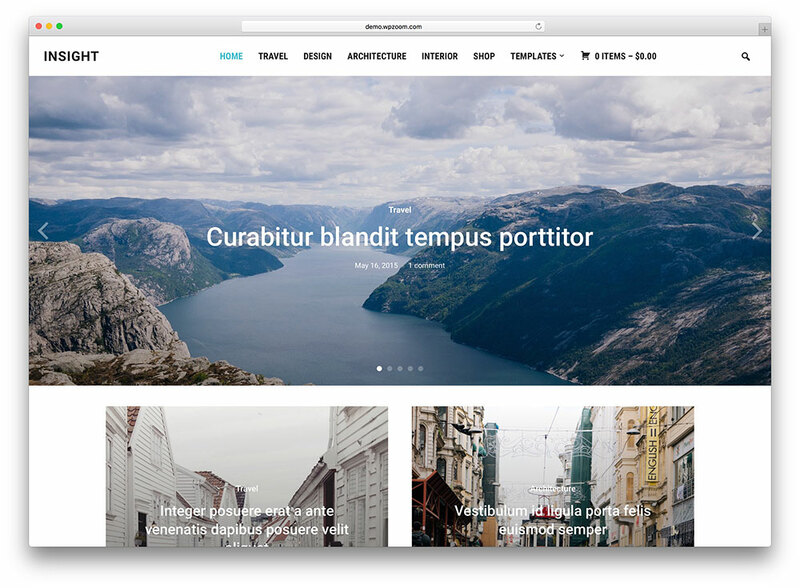 Compass is a fresh, modern and flexible WordPress responsive multi purpose theme. Built to be robust and pliable and thus well suited for a multitude of website needs for any scale and use. From massive to niche sites and from personal to corporate uses. This theme will guide your readers exactly to where you want them. This lets everyone find your content with extensive, native search engine optimization, so your website will top the ranks of all relevant searches. Built with HTML5 and CSS3 technologies, Compass utilizes the ZOOM Framework and the Dynamic Homepage Builder to allow you to create amazing, widgetized, custom, unique and memorable homepages the identify your website to the world. Jetpack enables you to use polished and professional Tiled Galleries, Slideshow Gallery posts and a number of additional, interactive features to let your users engage with your content, all created with a simple drag and drop and without a line of coding in sight. 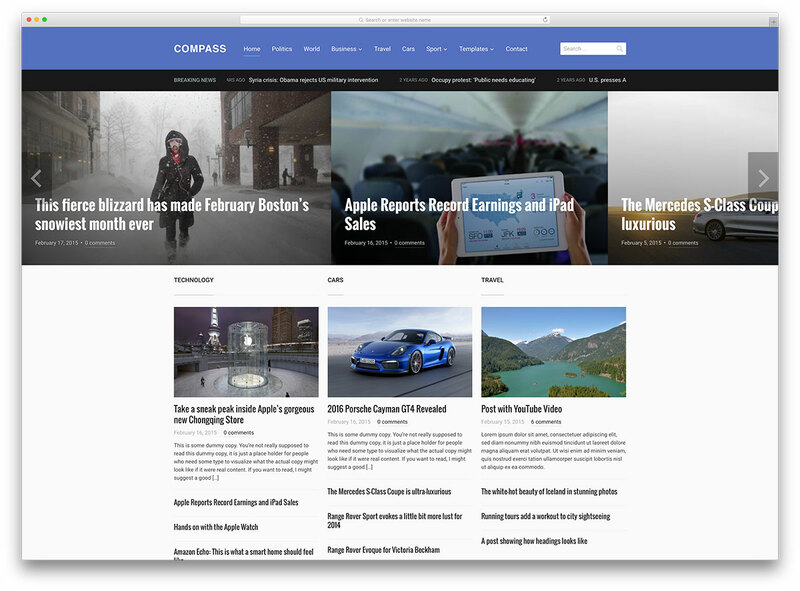 Start making gorgeous online news magazines that draw everyone’s attention to your content today, with Compass! 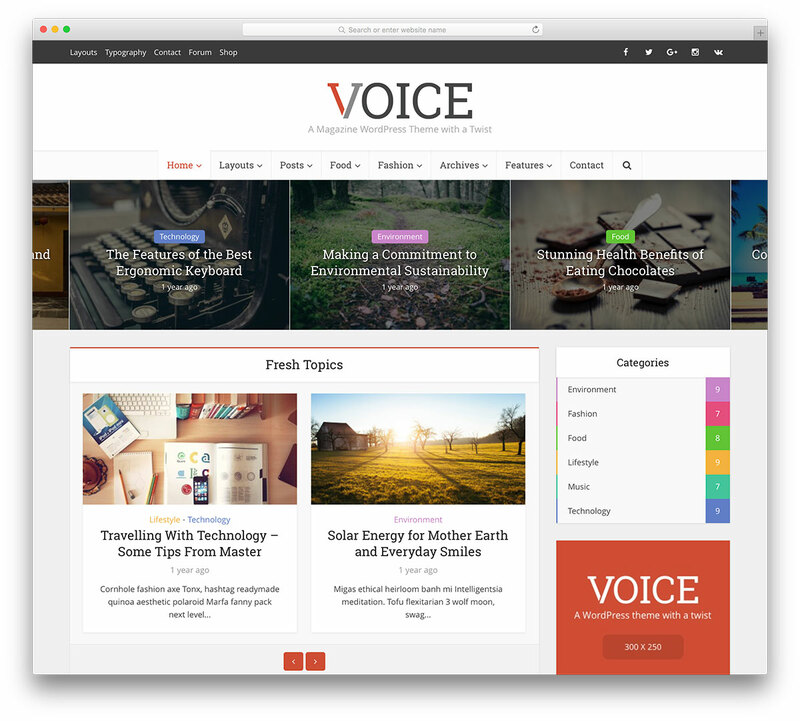 Voice is a modern WordPress magazine theme custom-built for personal blogs, online news and magazine websites. This theme will make your website look just as stunning on big screens as it will on tablets and smartphones. But you also have the choice to switch off its responsive mode through the theme options if you want. Designed with a fluid layout design, striking typography and great focus on readability and good user experience. In addition, it is highly changeable so it can match your personal preference. It comes with an advanced theme options panel that enables you to setup your website in 5 minutes. This theme allows you to boost your brand by giving you unlimited font and color options as well as options to upload your logo and icons to suit your branding requirements. Additionally, this includes several header layout options such as classic, simple header with navigation, or something more complex with ads and banners. It includes several layout options for post listings, which you can mix and match and get almost endless possibilities. This theme allows you to create as many post modules as you wish, grouping them by specific criteria and display them in a specific layout. 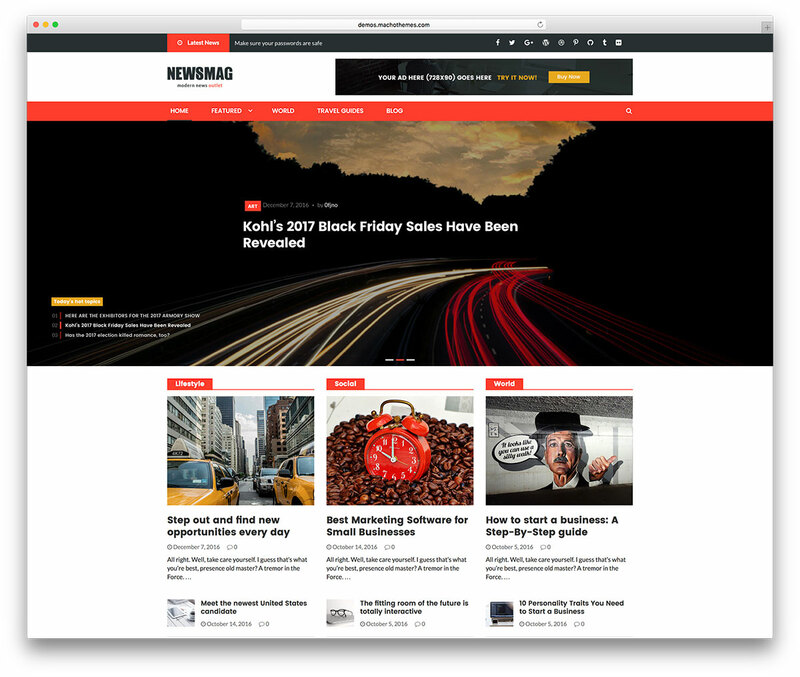 You can quickly and effortlessly build an online magazine with NewStar. The extensive collection of ready to use material will speed things up for you to have a final product up and live in the shortest space of time. That is something very likely to happen when you have such a powerful magazine WordPress theme at your fingertips. No need to higher someone to do it for you anymore. With NewStar, you can put together the exact website you always wanted to have. NewStar is ideal for creating travel, sports, automotive, nutrition, health, fashion and just about any other type of website. The assets and characteristics of NewStar theme are out of this world. You can change and customize pretty much anything and everything. That said, add your personal touch to it, go against the norm and start something new in the field you are the expert of. Little work is needed on your end so invest all the saved time on marketing and promotion. Your online magazine is set to reach high levels of success no matter what niche you are in. Thype is a perfect magazine WordPress theme that caters to loads of different projects and industries. Whether you would like to start a fashion, travel, art, lifestyle, health or politics online magazine, Thype is ready and set to help you realize your ideas. 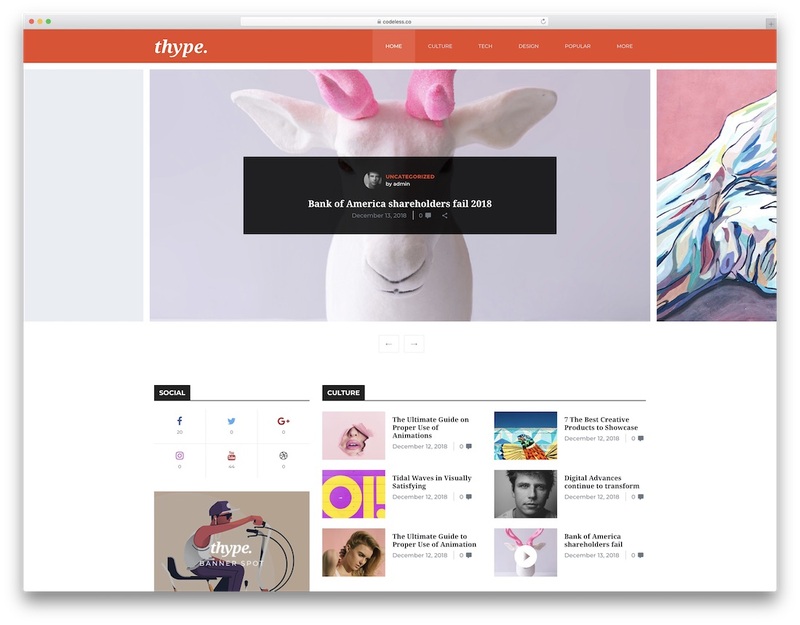 For magazines exclusively, Thype has nine different layouts that you can take to your advantage. Bear in mind, you can use them out of the box or you can improve them according to your wants. Whatever the case, the end product is a guaranteed success. Loads of different content blocks, headers, footers, premium plugins and integrated lazyload are just some of the goodies Thype treats you to. The limits are none when it comes to such a powerful, professional and sophisticated theme that helps you create all types of web spaces for striking magazines. 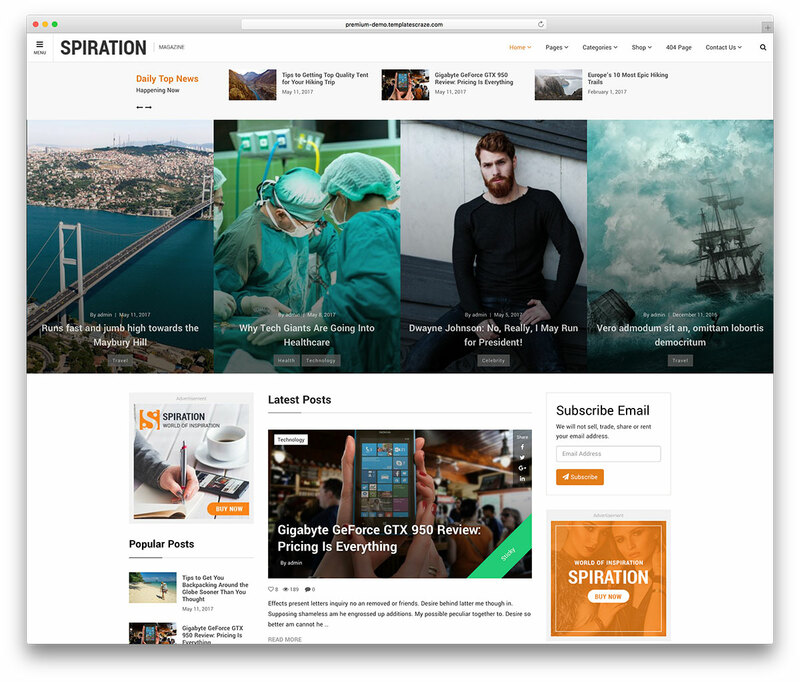 Spiration is an incredible multipurpose WordPress theme. It was specially designed for magazines though it can fit any type of business like a glove. You will get flexible predefined elements and a handy admin panel to build your website. A clean and edgy layout focused on typography and user experience. It comes with a lot of material to customize layouts entirely. You will get unlimited colors, custom backgrounds, Parallax and CSS animations and files. With awesome blog layouts that add a great value to it. It has ten custom emoji icons, 2 headers and even a portfolio grid! This is definitely a tool that will help you with social and marketing areas. It is not only crafty, but also very much involved with modern tendencies. Compatible with WooCommerce, so it will let you create shopping centers. It is also compatible with Contact Form 7 and Google Fonts. It is even built with the help of both Visual Composer and Bootstrap. Adapted to all screen sizes and works perfectly with all browsers. It comes with detailed documentation and for general questions you get custom support! Make a powerful online business impression with this sassy theme! Use Spiration! 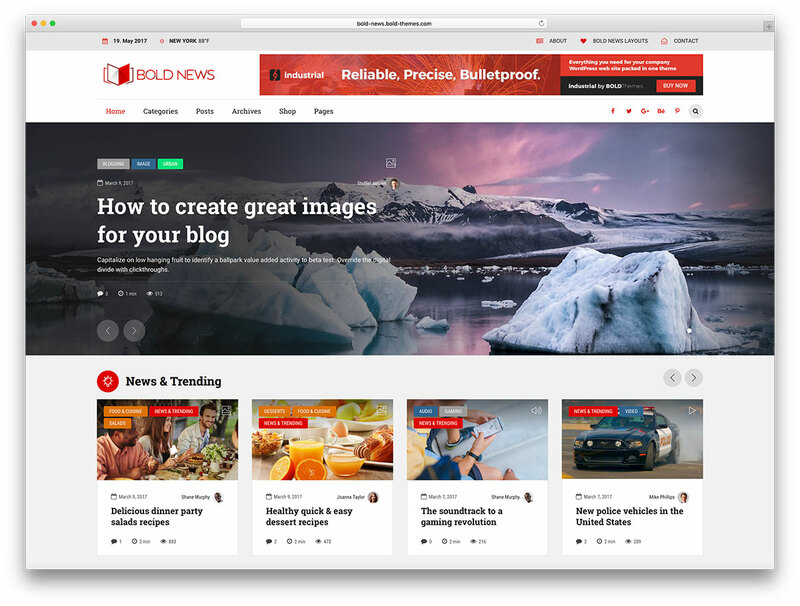 Bold News is a WordPress theme specialized in news, mass communication magazines, journals and more. As it is a very own Bold Themes creation, it uses their personal super fast page builder. It features multiple headers and sidebars, unlimited color mixing and lots of pages. You will get a page ready for boxed or fullwidth formats. Widgets and specialized article/stories add-ons are also available. Built to have easy access to customization through WordPress Customizer. It is WooCommerce and WPML compatible for purchase and translation respectively. You will get a child theme and many shortcodes to help your set up. A modern, edgy concept that reminds you of the busy city life. It offers a many custom icons and premium quality fonts. Use Google Fonts, Font Awesome and Icon Stroke. A responsive and thus adaptable to screens and devices. It is also compatible with most browsers out there. Go for this theme and receive tons of documentation to make building experience quick and painless. A support system and a FAQ section is also included. Get everything you need in a one-click demo install! Go for Bold News! Are you going for a stunning look that gives your visitors a fully responsive experience, as well as an amazing visual interface that’s also SEO-ready? PantoGraph will work well for you. Best for news, magazines, personal blogs; the PantoGraph WordPress Blog brings an aesthetic feel on any platform or device it is viewed on. It is well optimized for AdSense and other banner or contextual ads. With the striking look-and-feel comes a myriad of flexible options that is sure to make customization a breeze. You can easily modify different sidebars, headers, footers, and more on different pages. Work with at least 30 different layouts and templates without having to deal with any sort of coding. And speaking of coding, if it ever comes to that, PantoGraph has 50+ Custom Shortcodes for more design options. You also get 6 months of dedicated Envato Elite support so you can spend less time worrying about your layout and focus more on website content! 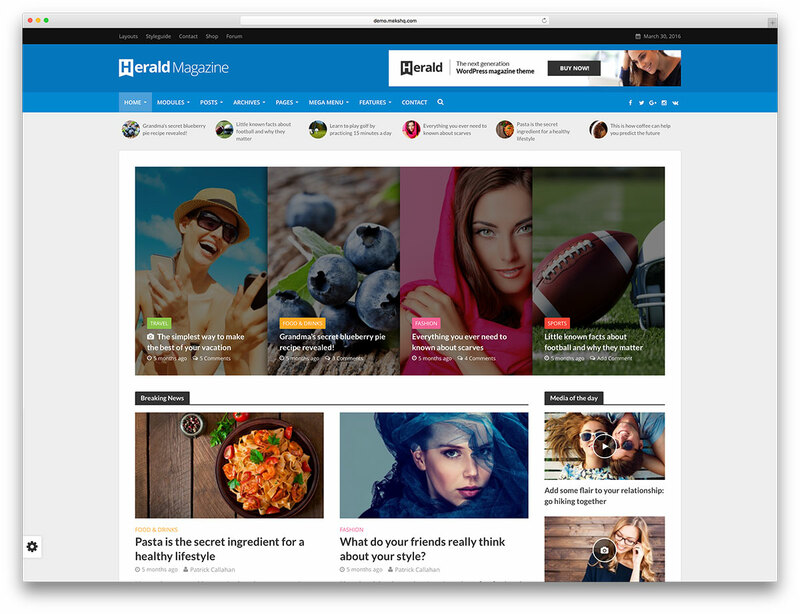 Herald is an exemplary WordPress magazine theme, whose features promise to expand your site’s capabilities. Its design is stunning, and you get to modify every single aspect. There are multiple personalization options for posts, and a large number of layout variations. Herald can also increase your profit margin, by introducing several monetization options. Advertisement banners can be placed on every archive page, single post, or even on the magazine site’s homepage. You can also create personal online stores, thanks to the introduction of WooCommerce. This innovative plugin is used by thousands of sites. Herald has custom and standard widgets, and a sticky sidebar setting that allows sidebars to persist while scrolling. It is much easier to keep track of your post view count, thanks to the post view support feature. The user can choose the number of views in order to sort through articles. You can now target a broader demographic, as Herald has a built-in translation function. By accessing the Theme Options Panel, you will be able to translate any text. After the well-written articles are complete, simply click one of the social media icons in order to share them with the world. For more information, be sure to check out the live preview. 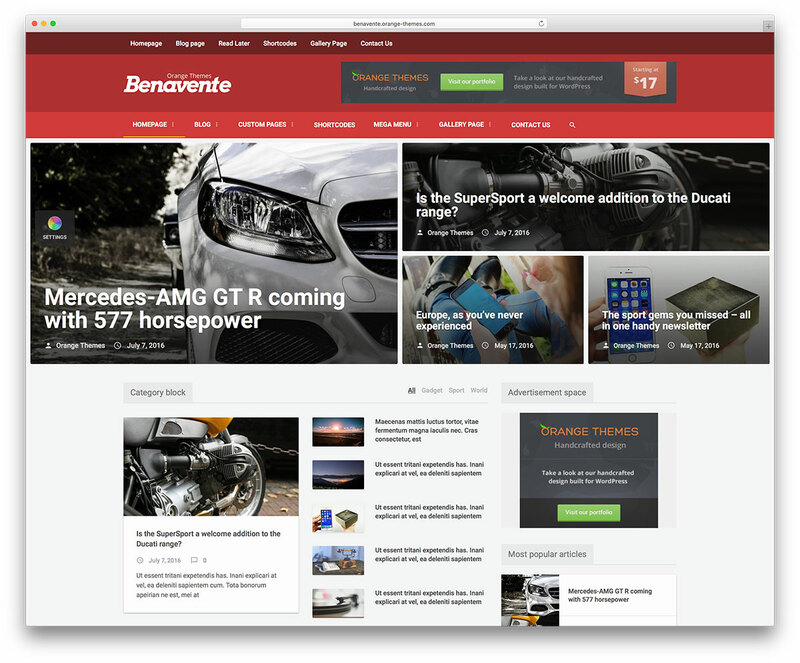 Benavente is a seamlessly intuitive and graphically polished and perfected, professional and highly responsive WordPress online magazine website theme. This theme has been crafted as a sleek and attractive solution for webmasters from any background and with or without previous web development experience to effectively put together sophisticated, functional online magazines in a matter of minutes, without having to write a single line of code yourself, and with a range of appealing features and capabilities that your users will love and that will help you showcase your articles and posts for the world to see in the best of lights. Benavente includes amazingly cutting edge web development technologies, powered by a combination of the latest implementation of HTML5 and CSS3 on a modular Bootstrap framework and featuring jQuery technology for added functionality and all sorts of neat perks and widgets. The one click install process is followed by a quick importation of your desired templates or demo website and an intuitive, completely visual graphical customization process with boundless freedom to choose anything from layouts and logos to gorgeous drop-down MegaMenus, not to mention hundreds of Google fonts and virtually endless color scheme combinations. Benavente is a solid choice for your magazine. Try it today! 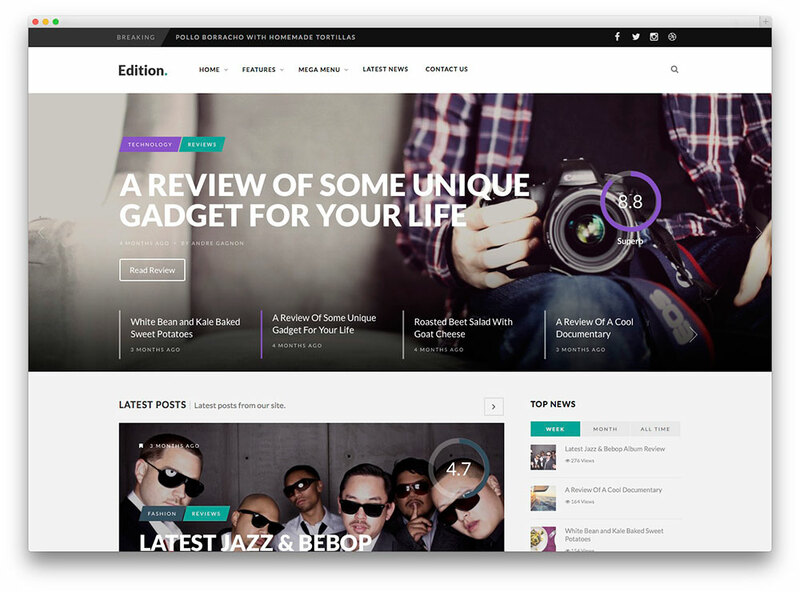 The Fox is a pixel perfect and precise, fast loading and flexible, creative and colorful, readily responsive WordPress contemporary magazine theme for creators. Also, this theme has been constructed as a unique, resourceful set of tools for developers with or without previous coding experience to easily craft the most amazing modern contemporary magazine websites in a matter of minutes, with a polished, finished feel and a seamless conjunction of design aesthetics and deep-running functionality. Moreover, The Fox makes use of the fantastically pliable WordPress Live Customizer, expanded to well over 100 customizable elements and configurations, giving you free creative reign over every single visible and invisible element of your layouts and pages. And with a plethora of attractive demo homepages and template pages, The Fox is perfect for webmasters who need to see their magazines up and running the same day they set up The Fox. 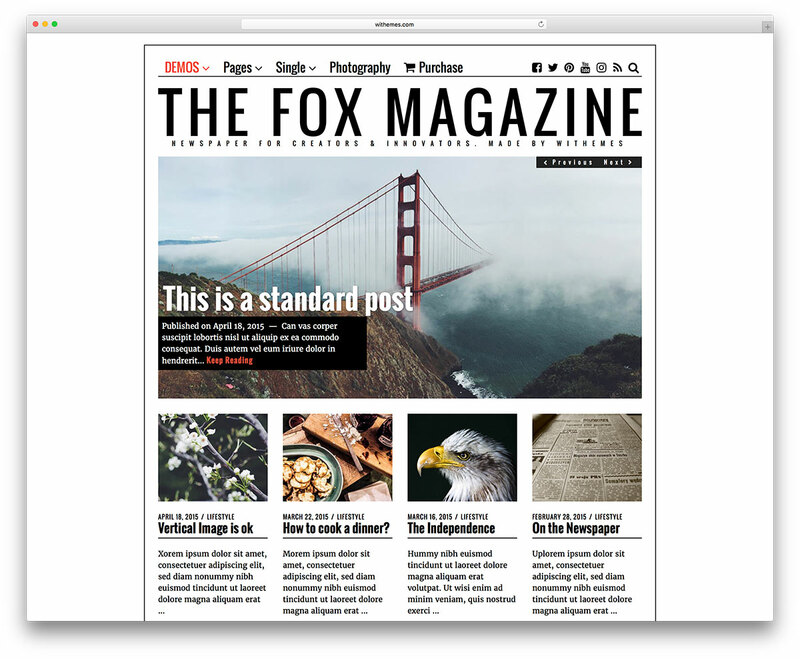 With intricately thoughtful features such as the Intelligent Related Posts System, or the jaw dropping Amazing Gallery featuring a drag and drop, flexible masonry grid, as well as attentive details like the Vertical Image Use shortcode that neatly spaces your content around vertical images seamlessly, The Fox is simply built to be editorial. Try it now! 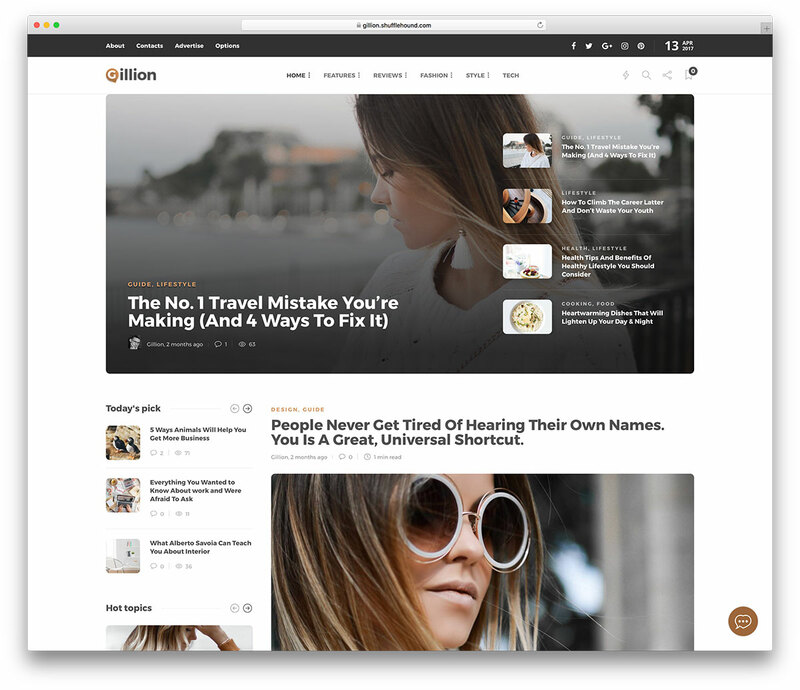 AlYoum is a cleverly coded and incredibly easy to use, intuitive and deeply engaging, technologically sophisticated and functionally resourceful, visually clean and pristine and very well structured, feature-rich and highly responsive WordPress blog and magazine theme. It’s an expansively creative and deeply powerful theme that has been carefully crafted over time to be an all-inclusive one-stop shop for all your blogging or online magazine website needs. AlYoum features eight different, professionally designed and completely preconfigured Homepage templates, as well as tons of different headers and layout possibilities, with 17 included Page Layouts and even an integrated Ratings System in three varieties to match any graphical needs you may have. With AlYoum’s Retina ready display and thorough, Bootstrap-based responsiveness, AlYoum will look just as beautiful across all devices, browsers, platforms and screen sizes. To top things off, AlYoum has been packed with amazing technological prowess, featuring out of the box bbPress compatibility, along with BuddyPress, WPML and even complete WooCommerce integration, including customized Shop pages and more! AlYoum is very user and developer friendly, so you can make your website look just the way you want in a matter of minutes. Say something the entire world will want to hear, with AlYoum! 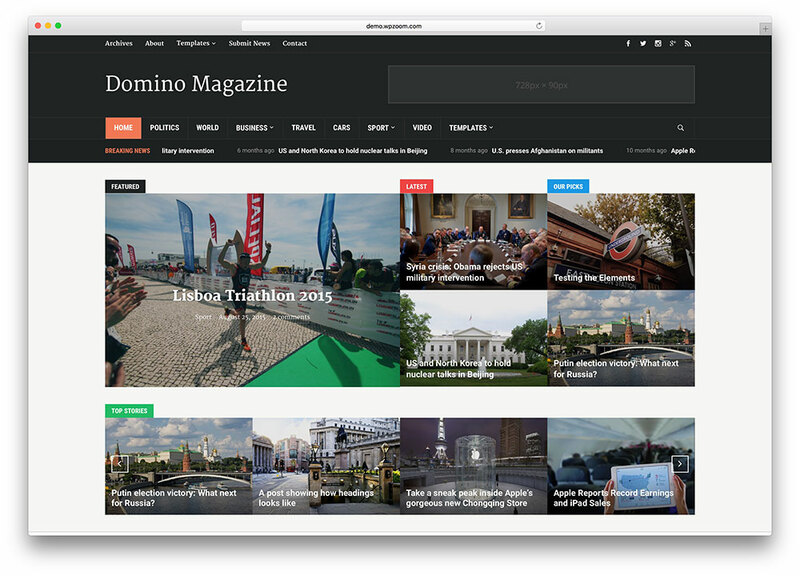 Domino is a colorful and vibrant, simple and elegant, aesthetically minded and deeply stylistically refined, solidly built and extremely reliable, profoundly functional and unimaginably versatile, very easily customizable and graphically polished and professional responsive WordPress news and magazine theme. It’s an extensively well developed theme that has been deliberately put together with the sole purpose of empowering webmasters of any background to easily and quickly create the most gorgeous and modern magazine websites in the market today. Domino has been decked out with sophisticated plugins, features and resources that can be intuitively deployed via the Dynamic Homepage Builder to suit your desired look, endlessly customized to your branding needs with the powerful Visual Customizer tool and further modified and adapted so your website truly stands out via an advanced set of Theme Options. All of this, combined with the seamless and dynamic Tiled Galleries, Related Posts, Sharing Buttons and other Jetpack supercharged pack features integrated into Domino make it a uniquely strong theme for presenting attractive and engaging content to all sorts of online audiences far and wide. With the gorgeous Carousel Widget, your best content will graciously present itself across any widgetized area you choose. Try Domino today! 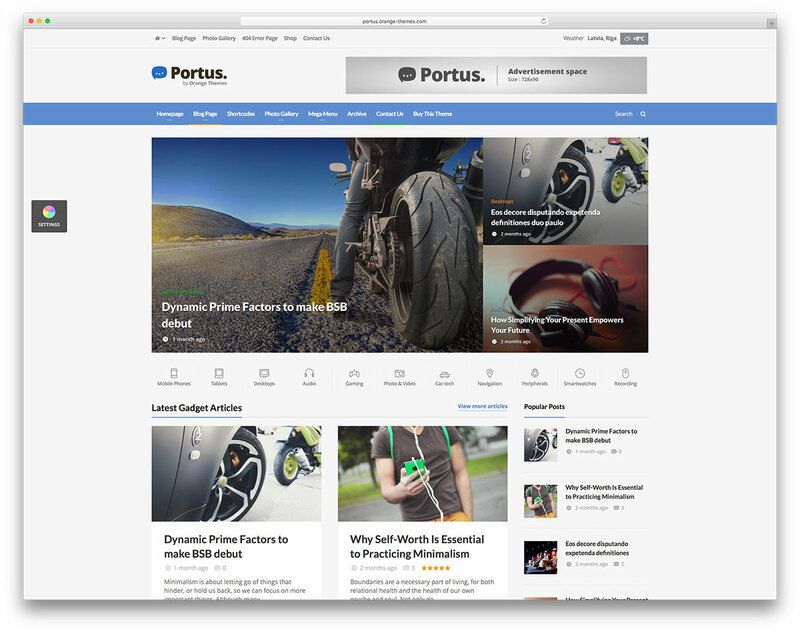 Few WordPress themes can ever hope to match Portus’s quality. It promises to simplify the web development experience, while providing you with a toolset of useful features. All followers and fans will be able to view your content, given that this product is entirely responsive. Indeed, Portus will work with smartphones, desktop computers, tablets or laptops. In addition, it is cross-browser compatible. This enables you to update posts and respond to comments while traveling. Users will get to enjoy a powerful Mega Menu, and more than 650 Google WebFonts. Personalized typography can greatly increase any article’s appeal. Drag and Drop technology is used for customization, and even novice users will be able to craft a professional site. There is no need to hire a web development company. You will be able to access an informative documentation source, in video or text format. Portus has multiple sidebar options, a fixed sidebar scroll setting, and a header that will always stay on top of the page. While scrolling, users will be impressed by your page’s Parallax effects. This promises to add an extra layer of depth and visual appeal. For those who wish to sample Portus, an excellent live preview is available for your convenience. Be sure to check it out. 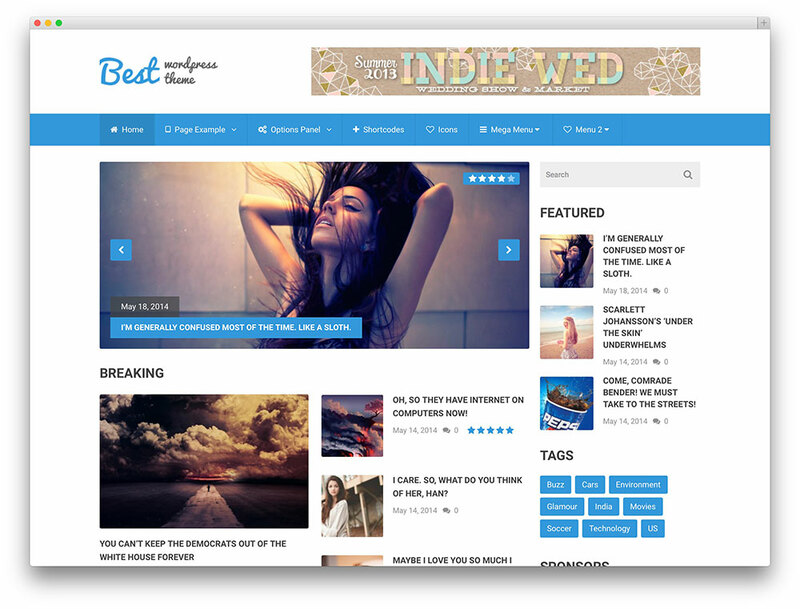 Best is a beautiful and colorful WordPress theme from MyThemeShop. It is extremely responsive and resizes its layout smoothly on different kind of devices to provide visitors a great viewing experience. It also looks sharp and clear on modern devices with high screen resolution because every area of this theme is retina ready. Best offer numerous styling options that give you freedom to customize the look and feel of your website in tons of different ways. It includes custom widgets, unlimited color options, Google Web fonts integration, unlimited sidebars and infinite options for background customization. It offers multiple single post layouts that allow you to choose the best post layout. You can also choose the pagination style that suits your website needs. You will also love the parallax 3D scrolling effect which Best integrates into its terrific layout. It has a MegaMenu functionality that allows you to create extensive dropdown menus. Users can easily scroll to your website with the floating navigation menu. Best also boasts a beautiful carousel feature that can elegantly display your content. The sliders have awesome touch support, so users using touch screen devices will be able to have an amazing user experience. Social media icons are also included in this theme to help your brand gain social presence and strengthen the readership in your blog. With its AJAX loading feature, you are assured that your website will load really fast and Live Search functionality powered by Ajax. The theme is designed using clean code and built with best SEO practices in mind to help your website acquire more traffic and rank well on search engine. It supports Schema plugin. Lastly, it allows you to monetize your website or blog because it is fully Google AdSense ready. 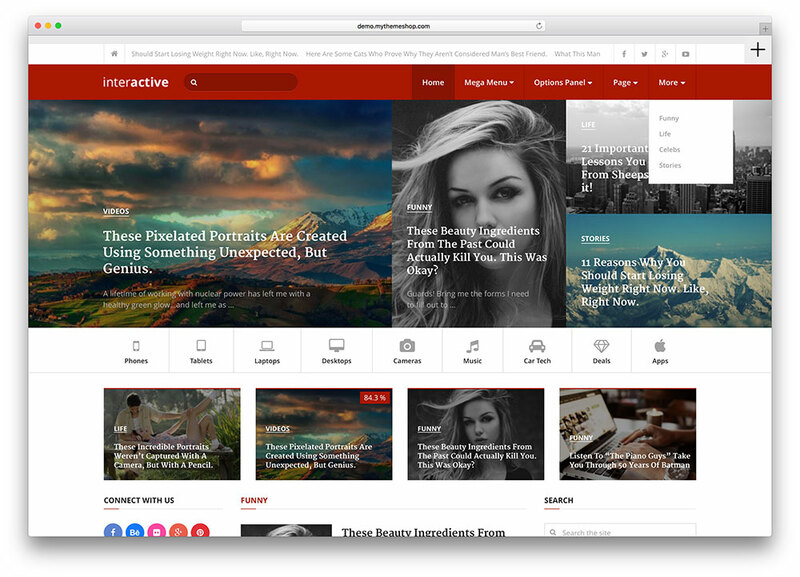 Interactive is an instant classic of a WordPress theme. Combining rich earth tone highlights with contrasting whites, this theme both soothes senses and accelerates minds, with a design centered on the necessity for speedy content turnover in a fast-paced environment like the modern Internet. Interactive is jam-packed with features, tools and options, in a dense forest of choices for every user that ensure the uniqueness of any website constructed using this powerful, versatile theme. 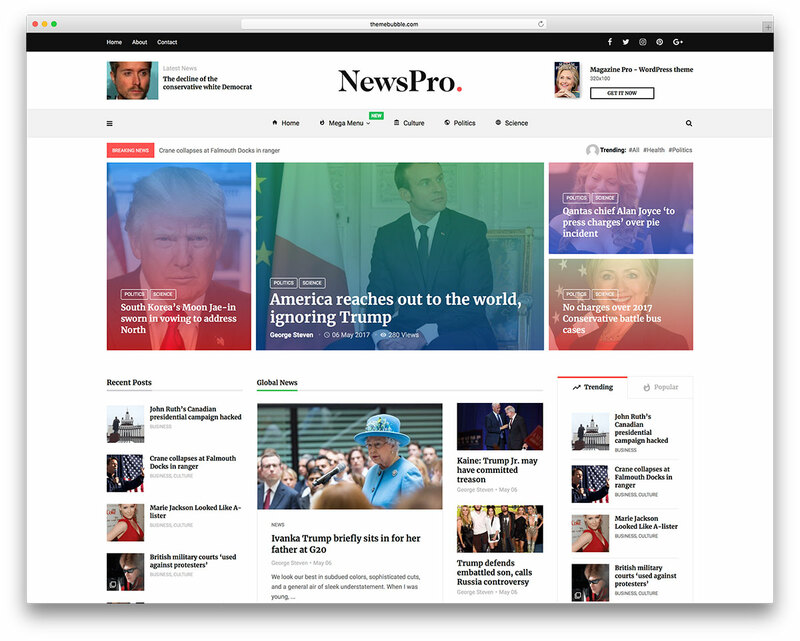 A design rooted in the modern era, Interactive catches the eye of users with prominently displayed image layouts, easy handling of standard column layouts, customizable breaking news tickers, optimized coding for extremely fast loading times, so appreciated in today’s era of bandwidth struggles and hardware disparities among audiences. Interactive can be installed with a single click and even allows for language translation, connecting your content with users all around the planet with the touch of a button, and thus easily and greatly expanding the reach of your influence over the web, and web culture itself. For mobile browsing, Interactive features an incredibly convenient off canvas menu that neatly slides out of view when not being used, in a manner both intuitive and accessible for users of all ages and demographics, making your website that much more memorable. Interactive is quite simply the theme of the times; built for an interactive generation, Interactive connects content with people. The new generation smart features give NewsPaper an edge. The creators added built-in features for plug-ins and widgets and they optimized it for search engines and is super-fast. Newspaper also looks silky smooth with high definition graphics and is expertly laid-out with its organization of topics. It is content-oriented so is ideal for sites with a lot of different content such as sites with blogs or articles which it organizes well with different categories. Its layout is clear and responsive making it a pleasure to navigate. Consequently, it automatically adjusts to fit perfectly on any device so you can use it anywhere. This comes ideal now when more people are using tablets and smartphones. The many options make it very customizable so you can adapt it to suit your needs perfectly. You can show your best content with a feature section that will make people notice. The tabbed page layout makes it very simple to find your way around. NewsPaper has many sections which give you options for displaying your content. Its parallax scrolling gives a smooth layered effect and sense of depth of field that can really engage the user. You can add reviews and icons, and with short codes you can add anything you want. The only limits are the limits of your imagination. Your imagination can do so much better with the help of Barta. 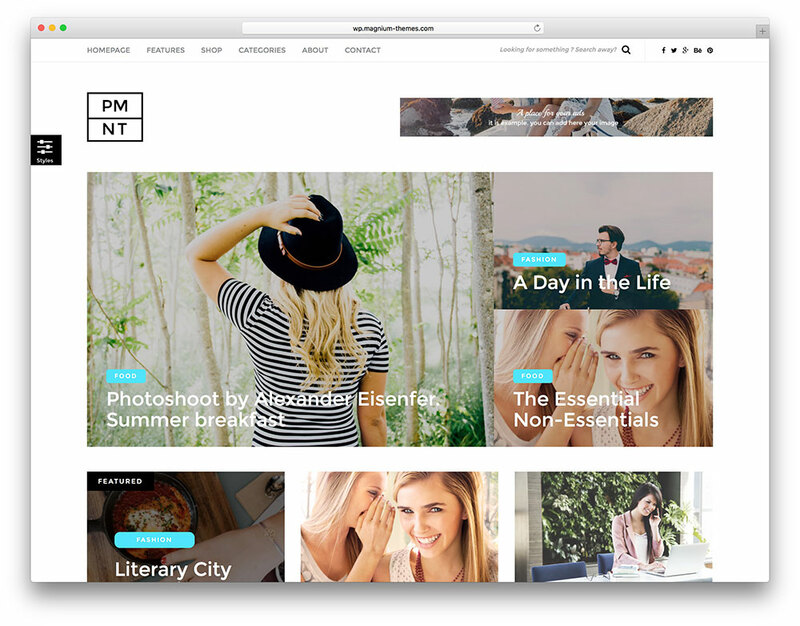 Highly sought after by designers, artists, photographers, visual artists, media enthusiasts and more, this is the ultimate magazine WordPress theme at present. While it has a huge collection of starter layouts for guidance, you are not required to apply a standard or specific theme. You are free to use any style for different pages to let out your individuality. This opens a whole array of opportunities to journalists or bloggers who dream of exercising their creative independence. All designs fit well with any mobile device due to Barta’s responsive nature. Barta includes seven homes, supports one-click demo install and comes fully compatible with RTL languages. The convenient Elementor drag and drop website editor also powers it for you to come up with the right design without the need to touch a single string of code. Show your creative genius successfully and tell the whole world why your website is the hottest in town. 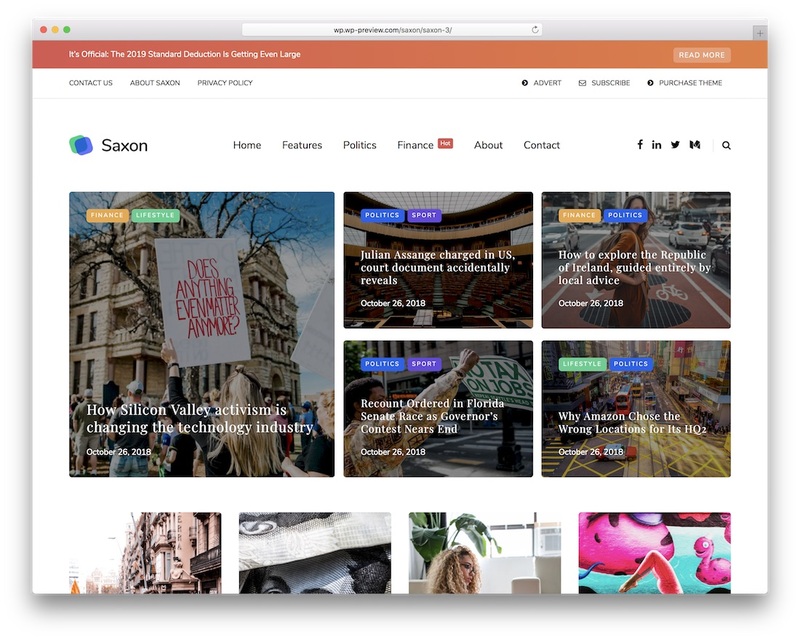 Give Saxon, the definitive magazine WordPress theme, a try and see for yourself what it can do. Whether you are updated with the latest scoop or just love chronicling stuff, Saxon has intelligent themes that will suit your meticulous taste. Add flavor to the mix by integrating video and audio files into your page and expand your reach even further. Additionally, you have 100% creative control, as you can pick colors, fonts and layout styles that are unique to your style. After the finishing touches, you can also instantly and professionally start showing off your quality and compelling content. Start your generic or niche online magazine with Saxon and begin growing a community of loyal followers. Entrepreneurship is a sleek looking Theme for Business sites. Additionally, it has parallax scrolling which gives a great 3D effect. It includes social media icons to connect it with your other pages and increase traffic flow. An authorbox at the end of posts lets you increase the profile of your contributors. It is compatible with WP Review Pro so you can add reviews and let people review and rate posts. You can also build an email list easily with Entrepreneur’s Subscribe Pro plugin. Entrepreneurship lets you build massive menus for your site giving categories and other options for your content. Moreover, you can easily switch between unlimited colors with its color picker. You can have as many sidebars as you want and position them where you want. It’s one click installation and one click updates make it a breeze to install. Entrepreneurship is very readable and with many font and typography options you can tailor it to your style. You can also build your own themes based on Entrepreneurship with the child theme support built in. It’s translation ready and has right to left support so it is easy to read by anyone on the planet. The video tutorials guide you through every step of the process. Insight is a modern, tech-savvy, interactive and carefully crafted WordPress news and magazine theme. It is well suited for a number of different purposes, particularly websites that require communicating visually heavy content to a mass audience. As such, the developers created Insight to suit well for the design and construction of news and magazine websites. Insight is sophisticated and elegant while responsive and light on its feet, adapting seamlessly from device to device and across browsers and platforms. It’s uniquely suited to keep your readers engaged and interested in your content, without distractions to let them stray away from every bit of your content. They coded Insight with powerful HTML5 and CSS3 technology, including the ZOOM Framework and Live Customizer that allow you to entirely personalize the look of your website with multiple color schemes and plentiful options to make your magazine distinct and thoroughly well branded. This theme includes amazing widgetized homepages with assets such as interactive featured product slider headers or footers, layout options for your post including grid and list styles and powerful categorizing features. Organize your content for your readers’ convenience and make them intrigued to return for more of your published material. The list of features could go forever. Thanks to the potent Jetpack, it supercharges your sidebars with Related Posts, Tiled Galleries, and more widgets that you’ll know what to do with! Let everyone have a peek, with Insight. It’s all about delivery, and your content is sure to find all traffic that is out there looking for it, thanks to Master’s search engine optimization, native to its coding, that enhances the indexing of every inch of your pages so they appear where they’re relevant, topping the ranks. It includes a wealth of features and tools to empower you to build your ultimate niche online magazine. Numerous professionally designed layouts offer a starting point for your pages, which you’ll then build upon with the Awesome Builder plugin and the advanced theme customization options through the Admin panel. Once you’re satisfied, adding content and images is a breeze, and they’ll be rendered in their full visual glory thanks to Master’s native BootStrap framework, which flawlessly renders your pages across all platforms, browsers and devices, maximizing your reach. Multiple video tutorials are available, so you can quickly get a hang of every powerful feature Master brings to the table. Try Master today, and you’ll never look back! 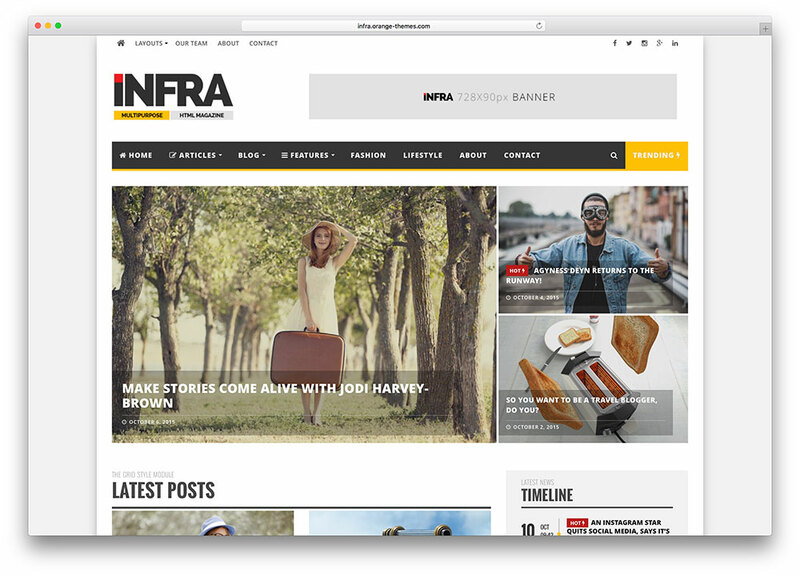 INFRA is a powerful and flexible, technologically articulate and very efficiently coded, well developed and fast-loading, highly customizable and very user and developer friendly, graphically expansive and imaginative, stylistically unique and malleable responsive WordPress news and magazine theme. Also, it’s a theme that has been created for the sole purpose of delivering daily content to a wide, differentiated or specific online audience in an engaging, attractive and appealing presentation that connects with a wide demographical spectrum. 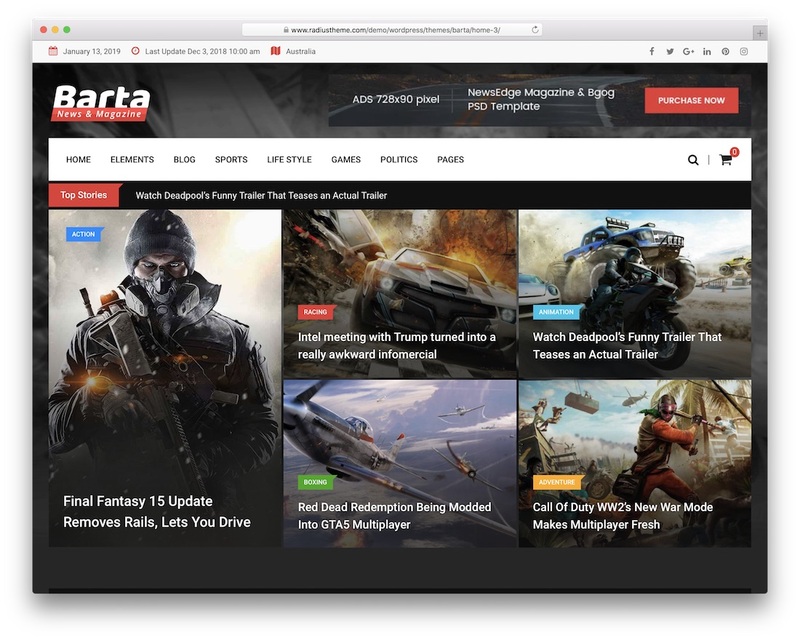 The developers also designed INFRA as a clean and pristine theme with extremely potent Post Style, MegaMenu, Sticky Navigation and Trending Articles functionality, among other select features exclusively thought out for the necessities of modern and sophisticated magazine websites. INFRA also includes seven custom Featured Image styles for your homepage, each perfect for different types of stories and visual hierarchies. A secondary navigational menu features drop-down collapsible capabilities, so it easily integrates with your user interface across a range of screen sizes. INFRA is also touch and mobile friendly out of the box and highly responsive owing to its Bootstrap foundation. As a result, it also powers the pliable row and column Grid System that lets you turn INFRA into anything kind of magazine you desire. Go above and beyond, with INFRA! 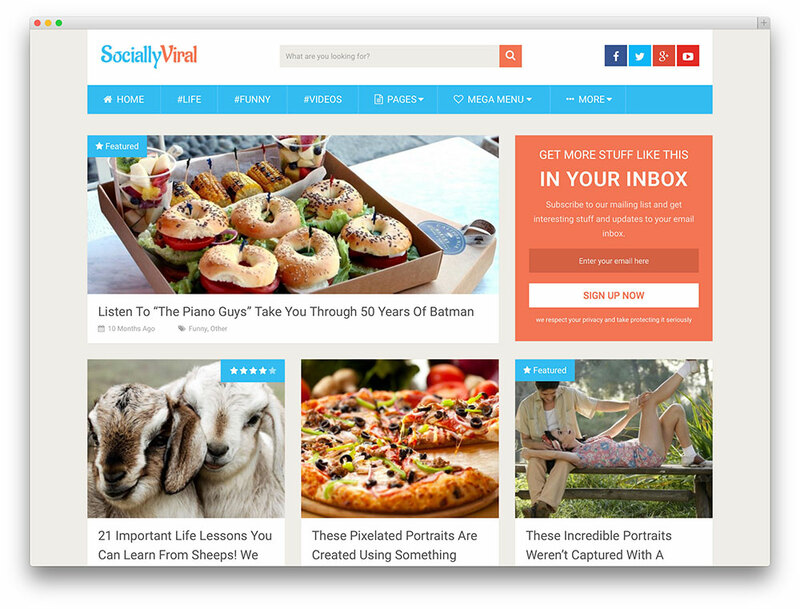 SociallyViral is an eye-catching and 100% responsive magazine style theme designed to grab the attention of your target audience and boost your website’s viral traffic. It is a lightweight website template that comes packed with features intended to reinforce social sharing, increase the traffic that goes to your website as well as improve your search engine rankings. SociallyViral includes some theme features that perk up the visual design of your website as well as its usability. It comes with a cool mega menu plugin that enables you to create stylish dropdown menus. This theme also comes with a parallax scrolling effect that creates a unique scrolling experience for your visitors. It has fully integrated with Review Plugin that lets users review your content. The creators also incorporated Social sharing buttons in this theme so your visitors can share your content with ease. It comes with four different loading effects to display more posts and a subscription box to encourage sign ups and build your list of potential clients. This theme is widget ready and comes bundled with powerful shortcodes that are very handy in customizing your website. It also includes retina ready icons, 630+ Google Fonts, unlimited color options, unbounded sidebars, Authorbox, advanced typography options and unlimited background options and RTL support. With its powerful options panel, you are able to take full control of all the aspects of your theme and customize it to suit your branding needs. They also fully optimized it for Adsense, which enables you to monetize your website. What’s more? SociallyViral has an Ajax loading feature to let your website load quickly and smoothly for better user experience. They handcrafted this theme with clean and valid code, Schema integrated and optimized for SEO. 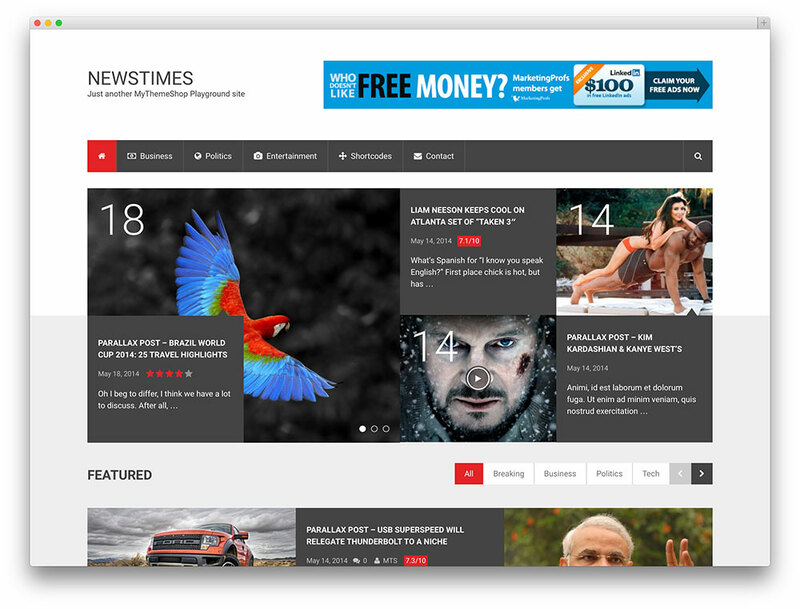 NewsTimes is a pixel perfect and fast loading magazine WordPress theme. It includes an off-canvas mobile menu suitable for all screen sizes. The creators coded it using the latest techniques in HTML5 and CSS3 to help your website keep up with the future trend. Additionally, you can create unlimited sidebars with unlimited color choices and 630+ Google fonts. Its shortcodes allow you to effortlessly add buttons, quotes, notifications, videos and more to your posts. The developers have included a Custom CSS option to this theme in case you want to modify some of its parts. They also fastened advanced widgets in this theme to help you display related, popular and latest posts on your website. Flaunt your splendid images using its built-in slider with smooth transition effects. And customize your homepage with ease using the theme’s homepage layout manager. If you want to personalize the theme’s default setting, you can tweak some of its components through the powerful theme options panel. They also integrated Custom social media icons that match the theme design to encourage users to follow your social media profiles and share your content to different social networking platforms. It has a built-in review system that lets you incorporate ratings and reviews to your post easily as well as allows your users to rate your posts. Moreover, they built NewsTimes using valid code and optimized it for speed. It has an infinite scrolling feature that loads more posts as the user scrolls your website. Furthermore, they used Ajax loading to let your website load smoother and faster. Lastly, they included an Ad manager in this theme to help you organize and manage your ads without difficulty. 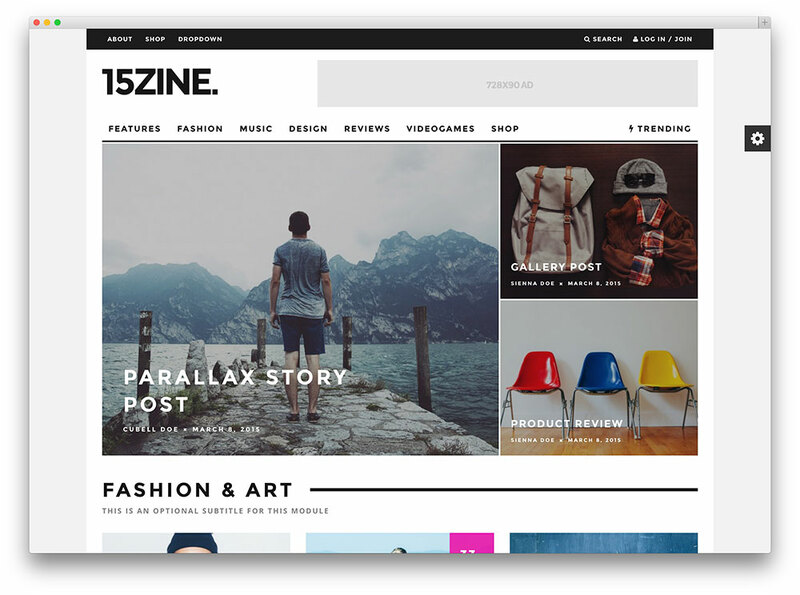 15Zine is a modern, engaging WordPress theme for magazine sites. Additionally, it is incredibly versatile and resourceful, packed with plenty of useful features. 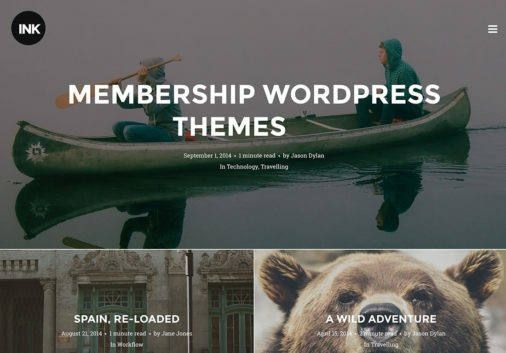 Developed by an Elite Author, the theme is well-received by the WordPress community. Users may also customize impressive layouts using the Homepage Drag & Drop page builder. It is extremely user-friendly, accessible to clients that are not very tech savvy. Additionally, the Trending Megamenu feature makes it easy for you to organize and track your most viewed posts. Add another dimension to your content, by taking advantage of this theme’s impressive featured image style system. You can transform simple image embeds into full-screen image embeds, without the need to alter the theme’s code. You can also fully express your creativity without worrying about a steep learning curve because you can easily perform the complex actions. The creators modernized all its features and brought it into the 21st century. For example, you may you may turn off a post’s header area, and enhance the overall look of the page. There is also an Ajax instant search function that spares you from endless scrolling, and some very popular icon variations. Moreover, the theme has incorporated banner management functionality, increasing your revenue from posts. Overall, 15Zine is the right theme if you are looking for flexible and mobile-friendly magazine WordPress theme to take your magazine style website to the next level. 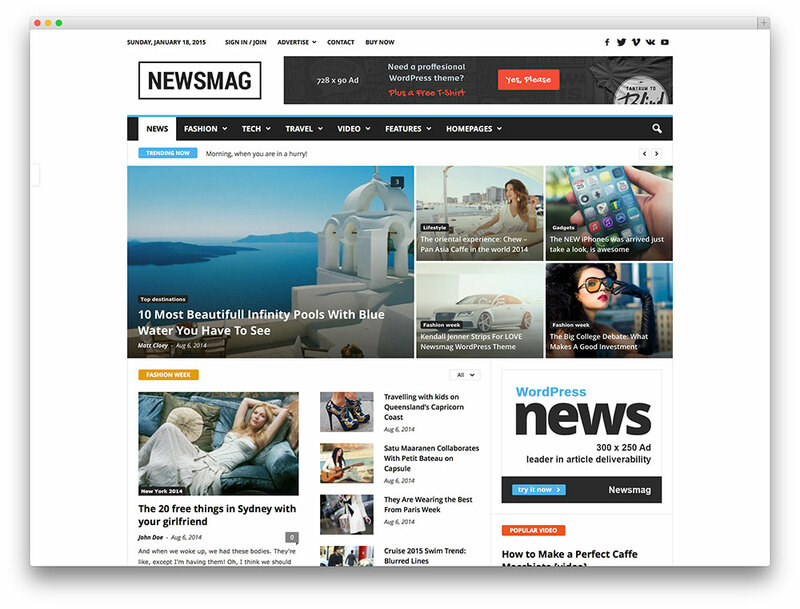 Newsmag is a clean and organized magazine theme appropriate for news, newspaper, magazine, publishing or review site. The creators built its solid framework on WordPress Booster Framework. They loaded six unique stacks (default, fashion, tech, video, sport and classic blog) into this theme, which you can customize afterwards. Powered by Visual Composer, you can build your own custom page layouts simply by dragging and dropping certain elements on desired position. Visual Composer allows also you to mix and match the 20 content blocks and the 3 page template. Newsmag comes with 22 custom widgets, 17 widgets for content and 5 are for general UI. Moreover, the custom content widgets display posts in different styles and support custom colors, advanced filters (by tag, category, author, post type), ajax pagination, ajax filtering and infinite load. You can effortlessly alter basic elements of your website such as the color scheme, background image, header and all that. They added a unique article system that ensures that you will not list the same article twice. They also integrated it with TinyMCE WYSIWYG, a WordPress editor that gives you a preview changes you’ve made in your theme. This theme has iOS slider to present your images in style. You can present the gallery in different aspect ratio with the ability to add description and copyright information to each image. It also includes other valuable theme features such as custom made lightbox, powerful shortcodes, Live Search with Ajax, Speed Booster v3 Plugin, smart sidebar, Youtube/ Vimeo video playlist, an advanced sticky menu, intelligent ad system, social counter and many more. Moreover, this theme also provides support for WooCommerce, TypeKit, Google Fonts, font stacks and WOFF font files. 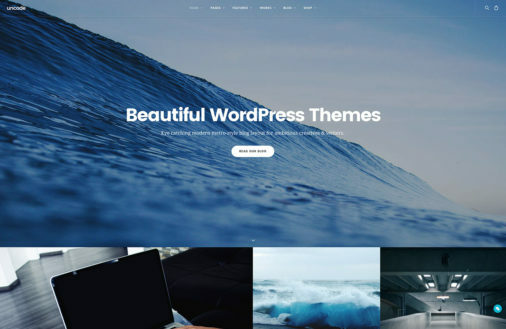 Piemont is a versatile theme for WordPress that is sure to enhance any website. With a large roster of features and a beautiful design, this product deserves your consideration. You can use it for travel, food, fashion, or multi-purpose blogs. Regardless of your niche, Piemont has you covered. It does not matter if you are an amateur or a professional, as long as consistency and quality are your ultimate goals. Additionally, this theme has a limitless number of Menu variations, including 4 menu positions: header, top, footer, and offcanvas. There are also Post Sliders for your home page, in addition to an unlimited number of header versions. Moreover, this product is a multipurpose blogger’s fantasy, considering that there are over 650 gorgeous fonts, and 11 pre-made color palettes. Lack of customization is not an issue here. Of course, any successful business has a merchandising plan. Yours can include WooCommerce, a versatile WordPress plugin that facilitates the creation of beautiful online shops. If successful, it can generate an additional source of income, increasing your bottom line. Piemont also offers Banner in header support, and 5 blog variations: vertical, standard, 2 column, masonry and compact list. Your logo position is variable, and your visitors can sign up for a Mailchimp Newsletter. Edition is an exceptionally unique magazine theme. It provides a great framework for online magazines and news website. The developers attuned this theme with WordPress 3.9 and specially built it to function suitably on tablets and mobile devices. Edition also enables you to create an eye-catching magazine website with its unique slider, grids or image layouts. Furthermore, this theme makes building page layout a child’s play, thanks to its drag & drop page builder. It also comes with powerful theme options to help you create a brilliant magazine site for your target readers. 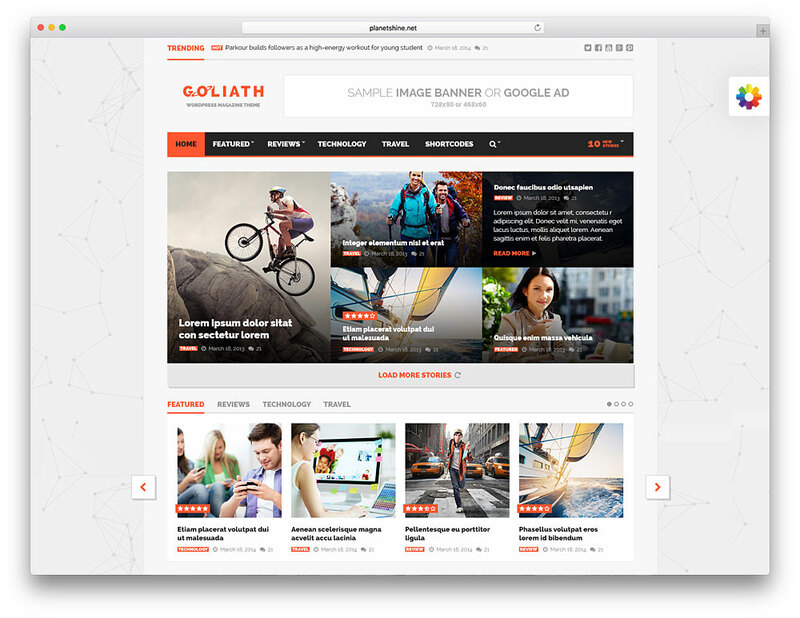 Goliath WordPress theme is a modern and sophisticated website template suitable for building an online magazine. This theme comes with awesome social media integration to reinforce social sharing and make it easier for your readers to follow your social media profiles. It makes website development really quick and easy, thanks to its strong and powerful framework powered by Bootstrap frontend framework. It’s also completely responsive and runs capably on all devices. You can customize this modern news magazine theme to suit your branding needs via the powerful Planetshine Control Panel. You can also create unlimited page layout without difficulty via the Visual Composer plugin. This theme comes packed with cool theme magazine features such as Google web fonts, infinite color options, eye-catching social icons, advanced category options, advanced post options, unlimited sidebars and layered PSD files. It also includes Slider Revolution plugin to help users add beautiful sliders in your website. It comes with a remarkable mega menu plugin that allows you to create tasteful drop-down menus. Such navigation certainly boost user engagement in your website and enhance user experience. This theme also allows you to hover on any post to get a preview of the text without leaving the homepage of the site. Additionally, it includes featured news slider, featured post slider with hover intro expanded text, select latest posts from any category with featured post option, left or right aligned sidebar, styled sidebar widgets, photo gallery & post integration thumbnails, easy to manage footer with multiple custom widgets and social icons and custom image banners or Google Ads. 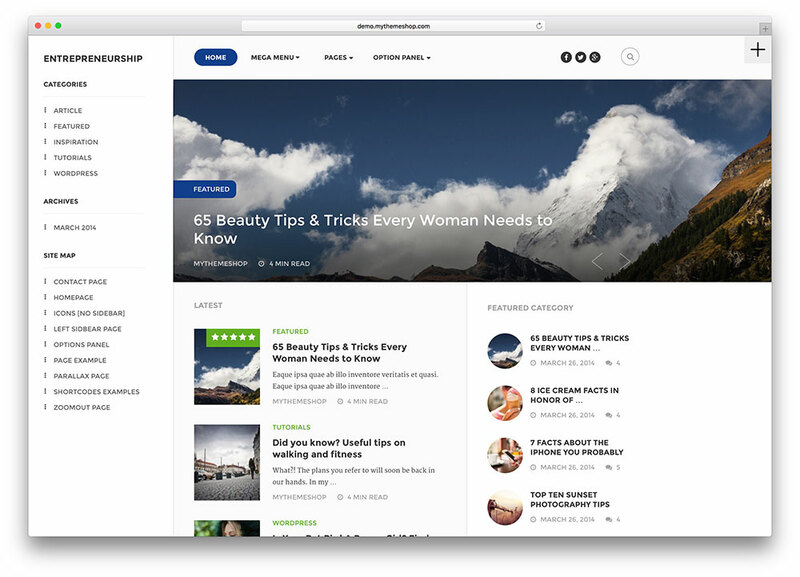 The theme also comes with bbPress plugin integration, supports WooCommerce plugin, WPML Ready, Auto hot articles and Smart Sidebar and many more. Hi, Aigars. These themes are really attractive and professional. These types of themes are speedy and user-friendly. But what are the standards do you follow for making a list of top magazine WordPress theme? We choose themes that are well supported by the developer, are regularly updated and are well designed and will look modern for years to come. If a theme hasn’t been updated for 6 months or more we immediately remove it because we see that developers don’t care about their product anymore. Is there any way to change focus blog theme ? You can choose between any of above listed WordPress themes and they can be used to replace any currently installed theme that you might have. Nice Collection of magazine WordPress themes.Please suggest which theme is best for fashion magazine website. We have a dedicated list of WordPress themes for fashion websites including magazines and you can find this list here. I have a.Voux theme.and want to change to one.of these. Do I need to pay or can I do.a.transfer for free? Each theme is sold separately. Therefore you need to purchase a separate license. However, you can switch to a different theme and all your content will remain in place and you won’t need to redo anything. Content is stored inside the database of your hosting and changing the theme does not affect it. You can also use the same hosting, domain and all that, just switch the theme and you are good to go. Nice Article…. I have a question that is: free themes have minimum loading time than paid word press themes such MagUp? Free themes usually loads faster because they don’t have any fancy scripts and plugins included. But you can clearly see the difference in quality between free and premium themes. Also, you can make any premium theme load as fast as free themes as long as you use a good hosting such as WP Engine, Kinsta or other. We are developing a pilot project for a new magazine theme. Would it be possible to connect with you to discuss what we are looking for? hey, the list of themes is really amazing. Can you please tell me are these i can use for free or i have to pay charges for using these themes. Above listed are premium themes only and the can’t be used without purchasing a license. I noticed that in your Smart Mag theme, you note “Compatible with bbPress and well-suited for hosting forums.” Are any of your other themes likewise suitable for forums in a magazine styled format? Most of the above listed themes does support bbPress. If you want to make sure before the purchase if the chosen one does support bbPress, please let me know the name of the theme and will check its support for you.